Do you have an idea for a treble clef pendant or some other musical themed pendant, but can’t find it in the chain stores? 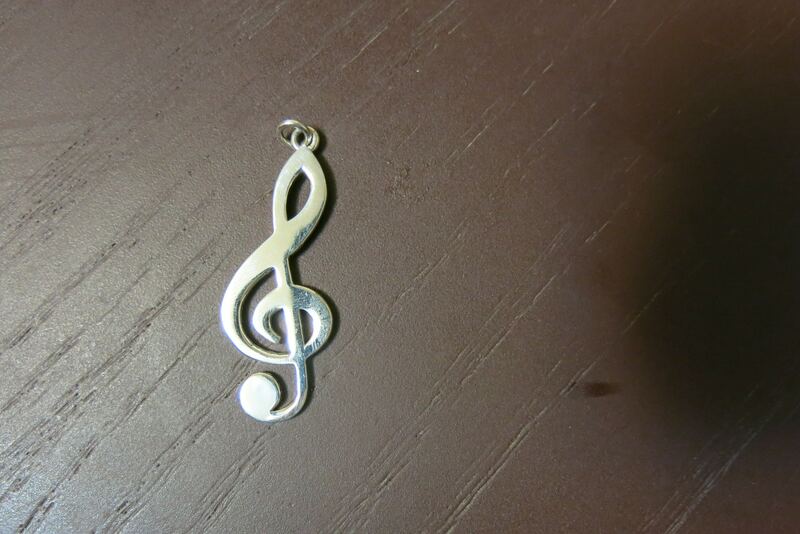 Valeria Fine Jewelry is the place for treble clef pendant designs or any other custom pendant for that matter. Browse our portfolio and send us a picture, description, or drawing of what you want. The process will be easier and less expensive than you think. This one was almost 1.5 inches tall and 1 inch wide, but it would be made smaller or up to 3.25 inches tall or wide. Custom pendants can be cast in Bronze, Brass, Copper, Sterling or Argentium Silver, white, yellow, or rose Gold, Palladium or Platinum. If you want to add some color, a wide variety of gemstones can be used, as well as enamel. If you want a different finish than the standard high polish, no problem. The starting price is for a Sterling Silver treble clef pendant. Click HERE to see another custom pendant design.